Vanilla Blue vacation retreat is perfect for those who do not desire the usual all-inclusive resort experience and would appreciate having knowledgeable hosts to guide them and arrange whatever activities or experiences they desire. Vanilla Blue hosts are Andrew and Melody Small. Melody hails from the U.S. and has been visiting Jamaica with her husband, Andrew, for the past 20 years. Andrew is a born Jamaican who, after 20 years of life in the States, has returned to enjoy life on the sea in his home country. 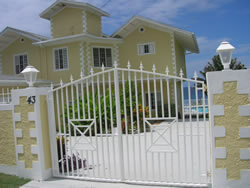 They are anxious to share their home and their love of Jamaica with old friends and future friends by offering their amazing villa on the sea as a unique vacation experience. 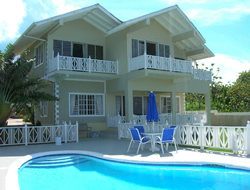 Vanilla Blue is located within walking distance to Rio Nuevo Beach and a five minute ride to Reggae Beach. Ocho Rios, the bustling tourist town, is a 10 minute ride away and offers a myriad of activities such as Dunns River Falls, Dolphin Cove, Chukka Cove horseback riding in the sea, Margaritaville, Island Village Duty Free shopping, Rain Forest tour, Blue Mountain tour, zip-line adventures, snorkeling and scuba diving. Please contact us for availability and rates. Free calls to the U.S. and U.K.